a kiln man (pottery) (q.v.) who stokes and cleans fires of kiln, in which clay retorts and condensers (as used in zinc extraction) are slowly cooled down. sets trays of porcelain artificial teeth in muffle furnace; controls temperature of furnace by attention to firing or adjustment of dampers, etc., and takes out finished teeth. places china flat ware in saggers (fireclay boxes in which ware is fired); completely surrounds ware and then fills saggers with ground flint. combines duties of bedder and of flinter (q.v.). is responsible for burning of bricks, tiles, or fireclay goods in kilns; sees that "setting" has been properly done before lighting fires, and keeps kilns at correct temperature; in small works and brick works also acts as setter, drawer, etc. (q.v. ), and generally attends to all operations at kiln. see kilnman (pottery) (term not need in North Staffordshire). packs saggers, i.e. fireclay boxes in which ware is fired, for glost placers (q.v.) in works whose flat articles are "dottled" i.e. , kept apart during glost firing by "dottle-pins" or "thimbles." a kiln drawer (pottery) (q.v.) working at biscuit oven in which first firing takes place. removes pieces of decorated ware from small enamel kiln after decoration has been fired. a kiln drawer (pottery) (q.v.) working at glost oven, in which glaze surfaces are fired. removes "burnt," i.e. fired articles from kilns after they have been cooled to required temperature often done by burner (q.v.). removes and carries away to bench, or assists placer (q.v.) in removing, saggers (fireclay boxes in which ware is fired) from ovens or kilns after firing; takes articles out of sagger and places on bench or in wheeled basket or wagon; in North Staffs , does not, as in other districts, include biscuit drawer or glost drawer (q.v.). see burner ; cf. stoker (119). see kilnman (pottery); feeds furnaces that heat enamel, hardening-on, or majolica kilns, and in districts outside North Stafford, biscuit or glost ovens; sometimes specifically named, e.g. biscuit fireman, glost fireman, sanitary fireman. fills sagger, i.e., fireclay box in which ware is placed for firing, with ware, and puts a small quantity of powdered flint between each article and each layer of articles to prevent fusion together, and packs remaining space with flint to prevent articles warping during firing. mixes charge of ground ingredients of glaze, i.e. borax, lead, etc., and pours from crane, i.e. suspended scoop, into frit kiln to be fused; runs resultant frit into water tank; clears tank of frit to frit bins. puts up pottery ware on trays, as it leaves hands of dipper (107) (q.v.). places ware, usually on "bats" or cast iron trays, and arranges them in kilns for firing; cf. placer, setter. assists burner (q.v.) and other skilled workers, generally; includes drawer, taker out q.v.). general term for any person employed at or in connection with enamel, hardening-on, or majolica kilns; or, in districts outside North Stafford, with biscuit or glost ovens in addition. general term for any man employed about kilns, including burner, setter, drawer, and kiln hand (q.v.). superintends firing of ware in kilns; decides temperature to which kiln shall be raised, how long it shall be maintained at that temperature, by what stages temperature shall be reduced, and when "clammings" (by which mouth of kiln is bricked up during firing) shall be taken down; sometimes specifically designated, e.g., enamel kilnman, biscuit kilnman, hardening-on kilnman, terra-cotta kilnman. a kilnman (pottery) (q.v.) who superintends the first firing process; cf. enamel kilnman, and hardening-on kilnman. a kilnman (q.v.) who fires ware after decoration has been superimposed on glazed surface; cf. glost kilnman, hardening-on kilnman. a kilnman (pottery) (q.v.) who fires biscuit ware, after it has been dipped in liquid glaze. a kilnman (q.v.) who fires "biscuit" ware which has been decorated before glazing, thereby burning decoration into the ware to prevent it running, etc., during glazing process. general term for workers employed at or in connection with glost ovens, including glost placer, glost fireman, and glost oddman (110) (q.v.). 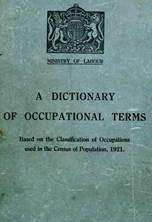 general term for workers employed at or in connection with biscuit or glost ovens, including biscuit placer, glost placer, biscuit fireman, glost fireman, biscuit oddman (110), glost oddman (110) (q.v.). packs clay ware in saggers (fireclay boxes); carries full saggers to biscuit oven for first firing, and stacks them in bungs (piles) nearly up to roof of oven; also generally does work of biscuit drawer (q.v. ); in china factories also acts as flinter (q.v.). fills saggers, i.e., fireclay boxes in which ware is placed for firing, with "biscuit" ware which has been dipped in liquid glaze, and carries them to glost oven, piling them in bungs (piles) nearly to roof of oven. a biscuit placer or a glost placer (q.v.) working on sanitary ware. attends "pot arch" or kiln in which clay pots are annealed after drying, regulates fires, gradually increasing the temperature for about a week, and decides when pots are ready to he removed from kiln. assists kilnman (q.v.) in reading and care of pyrometers; readings usually taken, by kilnman himself. dresser, gormer, kiln filler, placer, putter-in; places bricks, or saggers (fire-clay boxes) filled with tiles or fireclay goods, in kiln, after they have been dried, to he "burnt" or baked, arranging them so as to use heat to best advantage, and to prevent damage to goods; cf. kilnman, and placer. a setter (q.v.) who sets pipes, e.g. drain pipes, etc., on bricks in brick kiln to be fired. see drawer, kiln (bricks, etc. ).